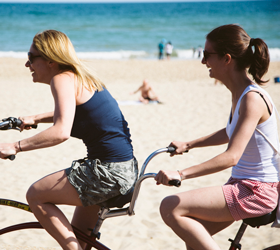 Get back in the saddle this spring and hire a bike to enjoy the Dorset countryside by bike. Explore the ancient Jurassic Coast by bike with Purbeck cycle hire. Book online from £8 for hire by the day and make the most of a car free stay in Purbeck. Mountail and road bikes can be hired by the day and includes helmet, lock, emergency repair kit and guides. Hire starts at £6. Reserve online with a deposit. Reserve online to explore the ancient Jurassic landscape with handy routes to help you make the most of your day's hire. Prices start from £2 for a child seat. Thank you to Front Cycle Hire for supplying the image for this blog.